Last weekend I learned that getting aerosol-propelled carburetor cleaning fluid into your eye is one of the worst pains a man can know. Seriously, imagine your eyelid turning into a coarse file, superheated and electrified. So lesson one is BE CAREFUL. This is the go-to advice you’ll get from armchair mechanics when your bike’s running bad because hey; it probably is the carb. Since an engine really only needs fuel, air, and spark to live... and the carb is responsible for two-thirds of that equation... and many motorcycles are carbureted... you get it. If you’re looking for a complete tear-down, rebuild, and cleaning guide for your specific carburetor(s) then you should find one written by a decent mechanic. Or better yet, consult the factory service manual. I’m just here to tell you all the ways you’ll manage to screw up in spite of reading those. At least, if you’re anywhere near as inept as I am. Here are the biggest pitfalls I found the factory guides gloss over, but I traipsed right into, when I attempted to clean my 1981 Suzuki GS450’s pair of Mikuni BS 34 carburetors for the first time. Know what the screws do, and their proper settings, before you start. Not all the screws in your carb hold it together. Some are settings for air intake, idle speed, or fuel mixture. Duh, you knew that! Do you know which ones, or where they’re supposed to be set? Figure this out before you go hog-wild with the tools and hey, check to make sure everything’s positioned properly before you commit to a “carb rebuild.” Your ride might just be a screw-turn away from running smoothly! Plan on taking apart a lot of your bike. On many motorcycles, the carbs are “right there!” You can touch ‘em, so you might think you can just pull them out. But you can’t. Carbs need an extremely tight seal on both the air intake box and top half of the engine to work properly. That means you’re going to have to take the airbox off. To get that off you might have to get the rear fender off. Now the battery needs to come out. You want to get as much crap out of the way as possible. These things are fragile, and so are the gaskets at either end. Any sketchy squeezing you can minimize is a plus. This isn’t really an issue for cars, which generally have the carb sitting right on top of the engine. Lucky you! Okay, you got the carbs out. Now the top end of your engine is exposed to the world. If you’re like me and you pushed your vehicle into the sun to work on it, leaves or acorns or dandelion seeds could fly in there and they’re not going to do your pistons or valves any good in your cylinders. Don’t laugh, the neighborhood mice are already eyeing your cozy engine as prime real estate. I put a nitrile glove over each hole; it clings to the outside and seems to keep the riffraff (and errant spirts of gas, oil, dirt) out. Do one carb at a time. 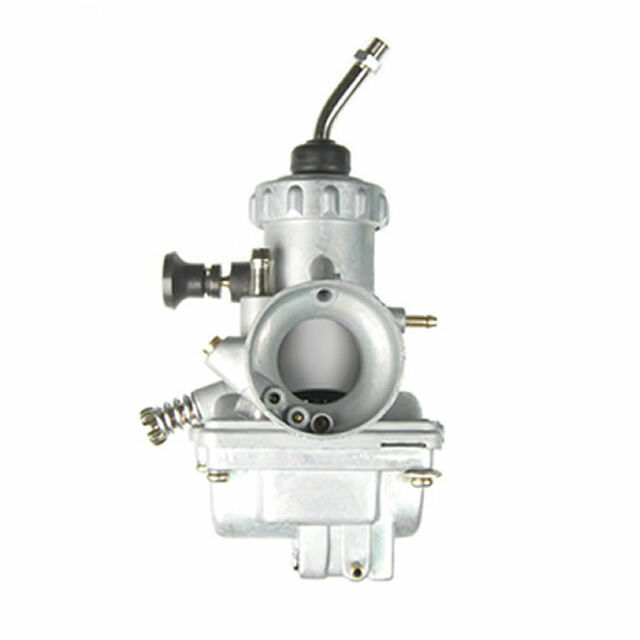 Many motorcycles have multiple carburetors. Some cars too, of course. You may have heard it’s easiest to dismantle them all at once since you’re just repeating each step in real time. Personally I think that might be alright once you’ve done it a time or two and you’ve got the process down, but for the newbie this creates more intimidation and more tiny parts to misplace. I’m not saying you’ll need the “extra carb” as a reference point, but it doesn’t hurt to have one handy. And you will, if you do one carb at a time. Have a really good system for not losing parts. You can’t appreciate just how tiny the little fuel jets are inside a carburetor until you pull one apart. Once it is apart, you need plastic bags or parts trays or some method of keeping everything together. I’m just sayin’, drop a pilot jet in a gravel driveway and you better hope your uncle can lend you a metal detector. Tiny adjustments go a long way. A fractional tweak of an idle screw or air screw alters your vehicle’s performance more than you might think. You might think of an engine using big gulps of gas and air, but really most standard carbs squirt the tiniest bit of both. From a practical standpoint, this means almost-invisible specs of dirt can actually be kinking your flow... and take it easy when you’re turning adjustment knobs. Your local auto parts store will sell plenty of aerosol-propelled combustable detergent for you to spray-clean the many micro-sized orifices of your carburetor with. First of all, recognize that this stuff sprays out harder than you think and will bring you unbelievable pain if you get it in your eye, worse if you eat it. Safety googles are a must and for godsakes keep your coffee away while you’re shooting this stuff. It’s so caustic you don’t even want to get it on your gaskets if you can avoid it. If you’re going to “soak” any parts in cleaner, make sure gaskets you plan on using or re-using are not in place. The metal inside a carb can be easily scratched; don’t go jamming a screwdriver in there to break something loose. Scoring the surface will throw things off and make your repair effort a wash. It might be dirty even if it looks clean. Nothing inside the my GS’s carbs looked messy, but after a deep clean with poison sprayed through every hole, the bike had much smoother power delivery and idle. I mean, after I finally figured out how to re-install the carbs without an air leak. It’s going to take a while to start a vehicle after a carb cleaning. Even when it’s not running, your car or motorcycle has a little bit of gas in the carb. So once you’ve cleaned it all out, that’s gone. A bit of cranking will be required to reactivate the vacuum and pull gasoline through to the engine again. If it doesn’t run right when it goes back together, start with the easy and obvious. Are you sure you put the vacuum lines back? All of them? It’s okay, you don’t have to be embarrassed. I sat cranking on my starter through the entire intro of a The West Wing episode before figuring out I had failed to reattach the vacuum line from the carb to the fuel tank. And only then did I notice it because I was poking around about to take the tank off again! Can’t believe I’m sitting here giving you mechanical advice. I still think this is the best advice a newb can get on any mechanical project. Don’t start on a project Sunday night if you need that thing to get you to work Monday. Don’t assume you can finish your job in the time it took to watch the YouTube video about it. This alone will alleviate a lot of the stress involved in doing something for the first time and prevent you from crapping out on a rush job. Bonus: cut-off sleeves add horsepower! Image via eBay plus an emoji.